Take for instance mobile phones; whether they are smartphones or not, mobile phones have the capability to store information. If you own a mobile phone and want to record something like a friend's phone number, a colleague's address, the weekend movie schedule, the price of soy milk at the local grocery, the license plate number of the vehicle that sideswiped you, an idea for your child's birthday party, the title of a song you just heard, quotable quotes, or a short poem you just wrote, you can take note of all these in your mobile phone. Use the calendar of your mobile phone for important dates and the notepad for ideas and other information. If you enter the information via the phone's texting facility, you can simply save the text in the draft folder for future reference. Apart from mobile phones, tech companies have sophisticated thingamajigs like iPods, iPads and other tablet computers that make keeping and tracking information easier. In the tech world, a notebook actually refers to a smaller, less powerful laptop computer. Laptops are also getting smaller and can easily be carried around most places. And yes, who can forget the palmtops? It seems that today's gadgets have given people many different options to the pen and paper. But can these two peas in a pod really be replaced? It seems that many have done away with bringing pen and paper with them on a daily basis. Many rely more on their electronic gadgets and can't seem to function as well without them. They seem to have forgotten that it is still practical to have these two writing tools handy. When attending a meeting, a lecture or some sort of event where you need to take down notes quickly, it's actually faster to write with a pen and paper rather than do some finger typing. In cases where you are allowed to electronically record a lecture or seminar, by all means use a gadget with recording capabilities. Otherwise, take down notes using a pen and paper because aside from words, you can use the pen to draw diagrams, pictures or other graphics related to the subject being discussed. In universities and colleges, laptops, notebooks, tablets, smartphones and other devices can be distracting to lecturers and other attendees. Students are sometimes caught watching videos on their devices, checking emails and social networking sites, or surfing instead of taking notes. In office situations, office workers attending meetings do the same thing. Gadgets tend to distract the attention of their owners because of what these gadgets can do. True, the pen and paper can be a tool for doodling and all, but it offers less temptation because you cannot open a YouTube video on your pad paper or paper notebook. The pen will never run out of battery. It may run out of ink but if you use your pen often, you will know when it needs replacing. Just to be sure, you can always bring an extra pen with you. With electronic gadgets, to make sure that you don't run out of power, you will need to tote around the charger or an extra battery. A pen and paper can easily fit into a small bag and is not cumbersome to lug around. If you lose your electronic gadget or drop it on the floor, it can set you back hundreds of dollars to replace it or have it repaired. A pen and paper notebook is cheaper unless of course you prefer to use a Montblanc pen together with a Moleskin notebook. When you need to leave a note for a friend outside his door or on the windshield of his car, you will need a pen and paper. If you like someone and would like to slip him your number, you will need a pen and paper. The pen and paper will neither crash nor slow you down. It doesn't matter if you have, excuse the term, fat fingers or not. The pen and paper will respond to your strokes with the same precision each time. It will not suddenly open your browser or delete your file. It will just write what your mind tells your fingers to write. Sure, there are dozens of applications that try to mimic handwriting and note taking. These applications have so many bells and whistles. No doubt, they are cool to use. But at the end of the day, all you need them for is to write something down. You can do that with a pen and paper. Of course some will argue that whatever is written on the paper still needs to be recorded in your gadget's contact list, digital calendar or in a software for record keeping or printing. Therefore, why bother with writing information down on paper? Simple, because there will be situations where writing on paper is quicker than typing on a keyboard or on the screen. What kind of pen and paper should you bring? The choice it up to you. There are too many options in the market today for writing implements and paper. Quality, price and application should be your basis for selection. For pens, there are ballpoint pens, fountain pens, disposable pens, multi-colored pens, roller balls, gel pens, fiber tip pens, and so on and so forth. Others prefer to use pencils. Mechanical pens are a popular choice when it comes to lead based writing implements. When it comes to paper, there are so many types to choose from. 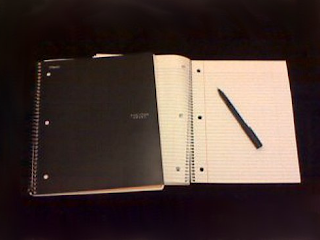 Notebooks and notepads come in different shapes, colors and sizes. The paper inside the notebook can be a plain sheet, with pre-printed text or graphics, or lined to help you write in a straight line. You can choose from different paperweight and quality. Paper can be glossy, matte, uncoated, recycled, handmade and more. Binding can be hand-sewn, padded, spiral-bound, to name a few. Notebooks have either hard covers or soft covers, with some notebooks using thick plastic, thick cardboard, cloth or leather for the covers. Your choice of notebook should be according to how and where you plan to use it and your own personal style. Writing with a pen and paper gives you a different feel – one that no cool gadget in the world can ever replace. Sure, gadgets today can do so many things that either entertain or increase productivity. Still, there is something special about being able to write with a real pen on a clean sheet of paper. It makes you feel connected to the past. Literary greats did not have the benefit of electronic gadgets to record their poetry and prose. Philosophers had no laptops to write down what they were thinking. Pioneering scientists never used apps to record their discoveries in medicine, astronomy, biology, geology, etc. Inventors, builders and engineers did not have tablets when they made their plans. Castles and monuments like the Eiffel Tower, the Hoover Dam or even the Sphinx were not erected using electronic gadgets. But surely they must have used some form of writing instrument and paper to take note of important ideas, plans and discoveries. So, have a pen and paper close by all the time. You'll never know when you'll need them. Disclaimer: This blog is not saying that the pen and paper are far better than today's digital tools and that these electronic tools should be done away with. There is nothing wrong with relying on technology for as long as it is used appropriately and responsibly. This blog is simply pointing out that it is still practical to have pen and paper on hand in case your gadget conks out. When there's no electricity to charge your gadget or a tsunami or any other devastating act of nature hits your location rendering your gadget unusable, a pen and paper is your best bet. Wet paper just needs to dry well for it to be usable again. But neither the sun nor the wind can help make your drenched or destroyed tablet, smartphone or laptop work again. In digital age pen and paper are loosing its existence in society.People are moving toward advance gadgets which can help them in performing task of writing easily.No technology can take place of real pen and paper.Still professionals like to carry it along them. I admit that I am unbiased slack further that is reason I infrequently arm in themes on span. This duration I would want to have a can't write my research paper to process on my thesis. Do you reason you could moment me in the power guidance for this?